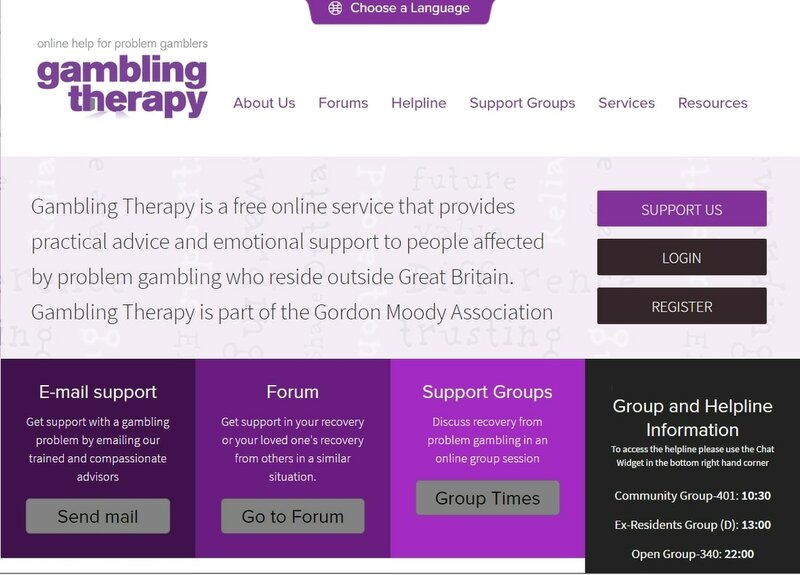 Gambling Therapy is a UK-based, free online service that provides advice and support to people affected by problem gambling, who love outside of the UK. It is part of the Gordon Moody Association, which is one of the UK's leading gambling addiction treatment providers. The site provides emails supports, a web-forum and online support groups. Many people, in the early stages of recovery from gambling addiction, find it useful to hand over financial control to a trusted family member for a period of time. This approach has several benefits: it ends the secrecy around gambling, it brings day-to-day supports into your life, it makes it more difficult to have a relapse. Speaking to an addiction professional can also help. We can be reached by email: info[at]problemgambling.ie or on 089 241 5401 (to arrange a call-back). A gambling addiction helpline is available at 1800 753 753 (Mon-Fri, 9-5:30). It is operated by Cuan Mhuire Addiction Treatment Service. They can also arrange for residential treatment in their Bruree (County Limerick) treatment centre. Their helpline service is funded by the gambling industry's Responsible Gambling Board. This service is not connected with Problem Gambling Ireland. Another gambling addiction helpline is operated by Dunlewey Addiction Services. According to Dunlewey's website, they also provide free, unlimited, face-to-face counselling around Ireland. Helpline: 1800 936 725 (7 days a week, 9 am - 11 pm). This service is funded by the Irish Bookmaker's Association and is not connected with Problem Gambling Ireland. Many people with gambling issues find Gamblers Anonymous (GA) meetings very supportive and beneficial in terms of their recovery from addiction. You can search for GA meetings in your local area here. SMART Recovery meetings, which deal with all types of addictions in a group setting, are beginning to roll out in Ireland at present. A list of meetings is available here. SMART Recovery UK also run online meetings, which can be logged on to from Ireland. Details are available here. Some people find that one-to-one counselling, or a combination of counselling and group works best for them. Lists of fully-accredited counsellors, psychotherapists and psychologists are available from the accrediting bodies, below. Make sure to check that the practitioner is experienced in dealing with gambling as an issue before starting treatment. Many people find themselves unable to explain why they continue to gamble despite the problems it causes in their day-to-day lives. The most obvious answer is “for the money” but is this true? When you win, do you spend your winnings on more gambling? Do you continue to gamble until you have little or no money left? In our experience, even though winning money may have attracted you at first, most people who have a gambling problem are using gambling as an opportunity to escape from other problems or pressures in their lives – problems at home or at work, boredom, loneliness or anxiety. Understanding what role gambling is playing in your life can be an important first step in beating the problem. How do I stop gambling? There is unlikely to be one single answer that will enable you to stop gambling. Gambling problems are complex and it can take time and effort to overcome them. • Nearly everyone has relapses along the way – in order to stop gambling for a decent length of time, you’ll need to be prepared to learn from these and try again. What can I do to deal with my gambling? If you feel strong enough, consider writing your feelings down, e.g. in a diary. If you are not gambling, note how you are feeling and how you have coped. If you have gambled, think about the events that led up to the gambling episode and record your feelings, during and after. • Try to stop all gambling while you are breaking the dependency. You need to do this in order to break the habit. • Look for patterns in your behaviour. Do you gamble, or need to gamble, when you feel bored, stressed or under pressure? • Reward yourself after a period of free from gambling, by spending some of the money you have saved on yourself. Buy something personal that is not related to gambling. If you feel uncomfortable handling money, take a friend along with you. • Take one day at a time. If you do this, you’ll find it easier to break your gambling habit. • Be prepared for withdrawal symptoms. You may feel depressed, irritable, shaky and you may get palpitations. • There will be times when you may feel desperate to gamble – don’t! Call a Helpline to talk to someone about your feelings. • Develop your range of interests, especially those that involve other people. Try to do things with friends and family who are not gamblers. • Dependency on gambling can be replaced by a range of activities and interests that will meet similar needs. • Try out some sports of activities which have a strong element of competition or involve taking calculated risks. ​• Be positive. The key is to ensure that any changes you make are manageable and realistic. Then, with each goal that you achieve, you will grow in confidence and self-esteem. You will also find you have the incentive to reach the next goal. If you have been gambling for many years, don’t expect your life to improve immediately. It will take a lot of hard work and motivation from you to change. • If you have a ‘slip’, do not punish yourself – breaking a dependency is very difficult. Instead, reflect on the day and think about what you have learnt from it. Congratulate yourself for abstaining for so long. • Be optimistic – you can overcome a gambling dependency. Some gamblers find it impossible to go back to gambling without losing control, whilst others are able to gamble again at a later stage but in a controlled way.